This recipe is unique in that very few know about it. 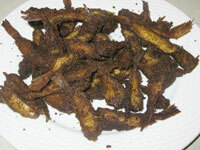 It is particularly good with dalh and rice or as a finger food. 1 lb smelt, or similar size fish will do. If only fish fillet is available then cut fillet into finger size pieces. Wash fish and remove the middle bone, if possible. Mix fish with all ingredients except oil. Heat oil in a pan. When oil is very hot add 1/4 portion fish (try to separate fish as much as possible).